I read “Lean In” because I didn’t think it was fair to bash the book before I read it. I was not impressed. I couldn’t relate to Sheryl Sandberg (the author of the book, mother of two and C.O.O. of Facebook). She describes discovering her kid has head lice on an airplane. The plane happens to be Google’s private jet. I, on the other hand, fly Southwest and I am just tickled that they have changing tables in the bathroom. Sandberg insists that every woman must forge the path that works for her and her family. Yet in advocating for women to have opportunities to be powerful, there is the assumption that power is desirable. And that power doesn’t come from family but from working in an executive position in the corporate world. But that’s not my world. I wear scrubs, not suits. I clock in and I clock out and that’s how I like it. There’s nothing attractive to me about helping a for-profit publicly traded company become richer. I can’t imagine a universe where I would feel compelled to work early in the morning and late at night while my infant cooed in the next room. 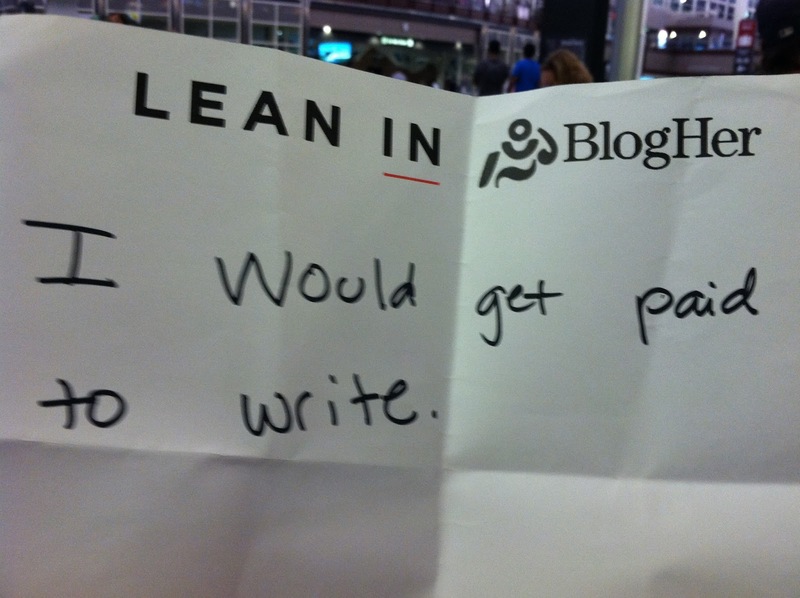 I thought Lean In’s message had nothing to do with me. And then I heard Sandberg speak at the BlogHer conference. She was engaging. She was confident. She was a fan of Girls, for god’s sake. I couldn’t not like her. I stayed for the Lean In Circles session after Sandberg’s keynote. I wasn’t planning to stay but everyone got a blank sheet that said “What would you do if you were not afraid?” We were told to write our answer on the sheet and we would dig into it more in small groups. I looked around to see if anyone else at my table was actually writing anything. I was afraid to even write down what I was afraid of. And that was how I knew I needed to stay for the Lean In Circles. From the Lean In website: Circles are small peer groups that meet regularly to learn and share together — studies show we achieve more in groups than we do as individuals. A circle can be a monthly roundtable at your house, a regular brown-bag lunch or even a virtual meet-up. There were six women at my table, including me. The rules of the circle were made clear. We each had to answer the question on the card from the Circle Kit we were dealt. The initial questions were easy; What is your name? What is your blog about? Why do you blog? Then the questions got harder. What do you regret? When have you overcome adversity? What are you most proud of? When did you feel most powerful? When did you feel least powerful? Who do you admire and why? Who do you envy and why? There’s something powerful that happens when we speak our deepest truths to each other. When you name your fear, you start to shift the balance between your dreams and your fears. Your fear’s grip loosens while your dreams emerge from the shadows. When you speak your insecurities out loud, they lose some of their power to hold you back. When you hear your own voice echoed when someone else speaks her fears, you realize you’re not alone. Research shows that people working in groups progress toward their goals more effectively than those working in isolation. My heart told me that being in this group was the nudge I needed to move forward. Leaning in isn’t just about moving up in the corporate world, it turns out. Leaning in is about getting out of your comfort zone. It’s about accessing the tools and the confidence to live your best, most creative, fearless life. It’s about breaking down the barriers- whatever they are- standing between you and the place you dream of being. Anyone can start a Lean in Circle, anywhere. Everything you need to get started is on the Lean In website. P.S. This is neither a sponsored post nor the workings of a cult. I’m Going to BlogHer.. look for me, okay? I started reading her book when it came out, and also was not impressed, but loved her speech! And I love your words about being afraid to even write what you would do if you weren’t afraid…. but that sounded like a powerful session. I agree those questions and conversations are powerful and important for women. I may need to join a cult… I mean, circle! She actually spoke to my company last week and I was impressed as well. I also can’t relate to her lifestyle but appreciate her sentiment and what she is working towards. I’ve been thinking a lot about this today. My friend Liz wrote a blog about how Martha Stewart was a much better feminist because she was honest about the realities of having power. I am in the middle of getting divorced. My dream job is dangling in front of me: money, benefits, childcare, good school district- enough, in fact, to be a single mom living above water. However, it would require moving my children away from their father. He would never accept that. If I were simply divorced- no kids, I could pack up and move- start a new life, but I have to take the relationship between my children into consideration- in fact, I have to put it above all else. Then, I have to nod and look down at my hands in shame if I suggest that maybe, just maybe we could work it out. Maybe just maybe, the job, the money, the insurance, will pave the way for a better life and maybe just maybe my kids and their father will be all right. My other choice is leave my children with their father and that’s not going to happen. So instead, I’m pushing the dream job away and praying I won’t have to subject my children to living in one house with two divorced parents and a mother with no health insurance.Does group work on leaning in help with that? Does voicing my real dreams really make a difference? Now I wish I stayed for the circles! Great post. First, I need to get the book and read it. Then join the website. I found all the speakers, including SS, at Blogher very engaging. They were inspirational and motivational speakers. Everything comes back to the same point. To let the fear go and get into action. Then, you need to have reliable support circles. Weight watchers work the same way. Beachbody work the same way. AVON work the same way. So why not do it for other purposes. It was so nice to meet you, first off!I wasn’t a big fan of Sandberg, for the reasons you say. I respect that she’s had to work hard to get where she is, but I think she’s had some luck too. But the idea of the circle was intriguing–I liked that part.